The location of the location of this building was identified by a reader 'Marshall'. Please read the comments for details. Thanks a bunch! According to the caption of the post card, this is Elks Lodge 211 in Jersey City. Based on the cars, the photo seems to be from the 20s/30s. But I have not been able to find the address of this lodge, or any other photo that shows this building, so I need your help. Do you have information about the lodge, or information that would help identifying where the photo was taken? Please use the comments functionality below! 2853 John F Kennedy Boulevard West, Jersey City The bottom was covered over but the top looks the same. I have driven past that building and on several occasions noted how interesting it would be to know what's underneath the store front and the building's former use. That was before I obtained the postcard, but I would still probably not have connected the dots. I will definitely do a 'then and now' post of the building. For now, a link to Google Maps i below. Thanks for the help! Priceless. BTW - do you (or anyone else) happen to know if it was originally built to be an Elks Lodge? And what other uses it has had through the years? If you have photos to share, please email and, with your permission, I will upload here. Thank you for the great site. I found this mention of it being on Hudson Blvd in a report on Sugar Refinery bowling teams in 1920. I think it was built for elks. Here is a report of a lighting contruction contract for elks building on Hudson from 1918. Not sure of other uses. Also here is a picture from a book on Journal Square. I like the text from the 'bowling' book "A side of bacon was hung up while the games were in progress and after three games in which Jersey City accumulated 852, 909, 906 pins, totaling 2662, as against 713, 771, 835, totaling 2319, for Brooklyn, the victors took down the trophy, gathered around it and brought the bacon home." I recognized the top of the building right away. I've long been curious about what's going on in the upper floors, as there are never any lights on except for presumable exit signs or stairwells. After you read the text about the image and where I acquired it, click on the small version of the JSQ aerial view and in the expanded version, it is the large reddish building just to the left of center and slightly lower. There was still an large empty lot adjacent on the left side, that ran all the way through to Pavonia. The color is because this image, like many of its kind and time, were created in black and white, then hand tinted. The tinters were often "creative" in interpreting colors of buildings they had never actually seen. The full-sized original of this image is hanging on my wall, directly above my desk. Hi, that's an interesting picture. At first I could not figure out how to zoom in, but once figured out, you can really see some details, trams, buildings that have been replaced, etc. I've got three different pictures of Jersey City Elks Lodge rooms. I have a picture of the lodge room in that build old Elks Lodge building. The lodge room in that day was very nice. But, it's not the best Elks Lodge room I've been in! The Elks have lost an extraordinary amount of their great old & ornate buildings either by bad descissions made or property taxes. Funny how an orginization loves American Goverment while the US IRS taxes this Fraternal Orginization over the hilt! To hell with the IRS!!! I feel for the Elks over all being taxed as heavily as they have been! It's sad and humiliating to watch this happen to a good Frat with so much tradition and rich history to be distroyed by design and apathy of not of enough new younger members. 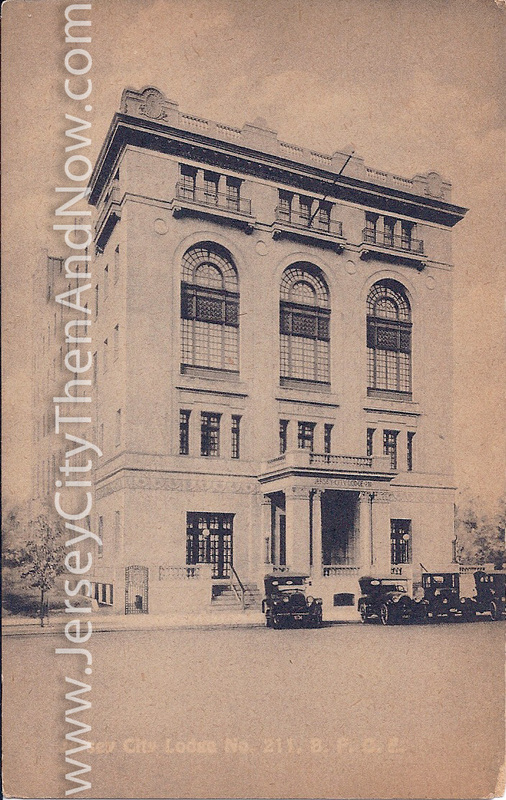 I have a lithograph picture of the lodge room in this the old Jersey City Elks Lodge #211! Yes, I love old Elks lodge and Masonic Lodge rooms they are freaking awesome.